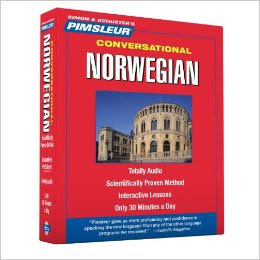 · Sixteen 30-minute lessons of spoken Norwegian language instruction. These sixteen lessons are the same as the first sixteen lesson of Pimsleur's 30-Unit Comprehensive Program. · Each lesson includes an introductory conversation, and new vocabulary and structures and includes practice for vocabulary introduced in previous lessons. · Essential grammar and vocabulary. Topics include: greetings, numbers, meals, shopping, telling time, scheduling activities, and asking and giving directions. · No mindless repetition! Converse with native speakers in natural (and useful!) conversations. · Easy, fast, fun and effective language acquisition. · Completely Audio - anytime, anywhere. No computer necessary! Unlike expensive software programs which tie learners to a computer, Pimsleur courses are available in CD or mp3 format to meet your needs. · Receive an instant credit of $150 to trade up from the Conversational to the full Level 1 Comprehensive CD course.